Call your local store today for a quote! We know that as a new or existing boat owner, you want to outfit your boat with the best products. The West Advantage Volume Discount Program now offers two ways to help you save on equipment purchases. Best of all, West Advantage Reward Members earn points toward rewards on purchases. Find the right program for your needs! Save 6% on Volume Discount Purchase of $500 or more in a single transaction. Bring proof of registration to any store to qualify for the discount. Proof of boat registration must be presented to qualify for discount. 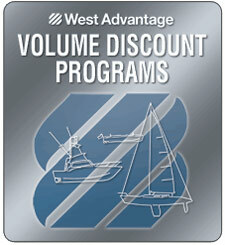 Enrollment in West Advantage Rewards membership required to receive discount. New Boat Owner discount is valid for one single qualifying transaction. Offer is for 6% off on Volume Discount Purchase of $500 or more in a single transaction. Discount is applied on Volume Discount Purchase total only; excludes shipping and taxes. Discounts cannot be applied to past purchases. West Marine associates are not eligible to participate in this program. Limit one membership per customer, per boat. Exclusions to Volume Discount Purchases apply*. Save 11% on Volume Discount Purchase of $2,500 or more in a single transaction. Offer is for 11% off Volume Discount Purchase of $2,500 or more in a single transaction. *Coupon is not valid on previous purchases and may not be combined with other coupons or offers. Not redeemable for cash or gift cards. Limit one coupon per customer, per day. Sale-priced, discontinued and excluded items listed below do not contribute to threshold limits when figuring discounts and will not be discounted by this coupon. Excludes PLUS Plan extended warranties, memberships, services and gift cards. Excludes sale-priced and discontinued items, plus Minn Kota®, Torqeedo, Mercury®, Cannon®, Humminbird®, Daiwa, KVH®, YETI®, Avet Reels, GoPro®, OluKai, Hurley, Simms®, Dubarry, KULA, Native Watercraft™, Oldtown®, Yakima®, Helly Hansen®, Maui Jim®, Patagonia®, Prana®, Aftco®, Pelagic, Costa®, Mares Diving®, BOTE® Paddle Boards, Garmin™, ICOM®, Lowrance®, Simrad, B&G® Products, select Raymarine® products, SkyMate®, Shakespeare® Fishing, Calcutta®, ACR®, Johnson Outdoors, select Magma® products, Confluence Outdoor, Boardworks Surf, Fusion®, Sony®, JL Audio®, Harken®, Penn® and Shimano® products. Discount does not apply to taxes, shipping and handling charges or similar processing charges. Offer valid for retail transactions only. Offer void where prohibited by law.